"Si Phan Don" in Lao means "4000 islands". 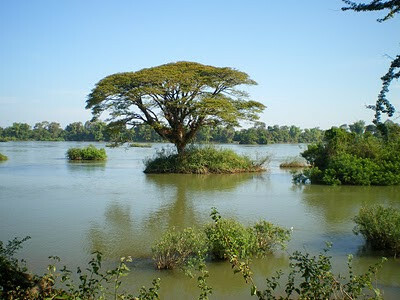 Around 110 to 60 kilometres down from Pakse the Mekong River forms different streams and these form hunders of islands. More than 60 000 people are living here, mainly from fishing. And here you find also the Irrawaddy Dolphins. See a picture by peterjones79. 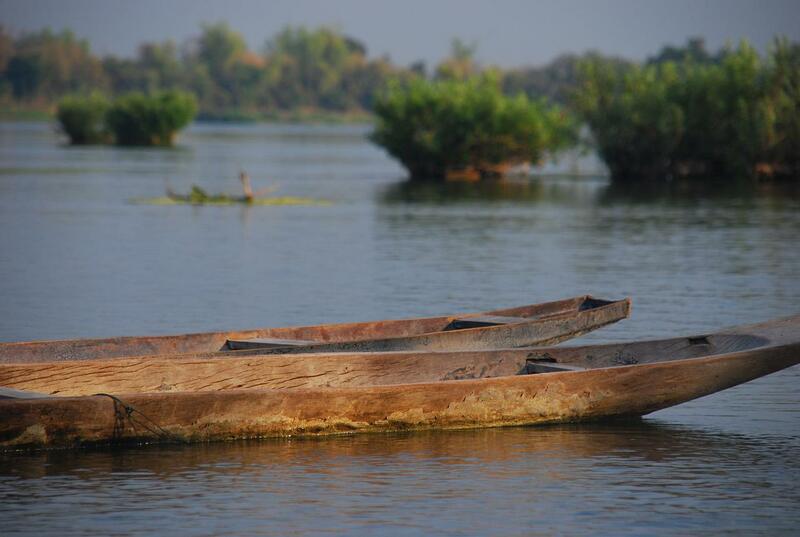 The best time to see the Irrawaddy dolphins is in the morning or in the late afternoon. 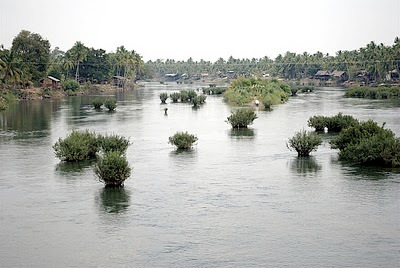 But: Be aware: The Mekong Dolphin is endangered. Read: Is there a future for the Mekong Dolphin? 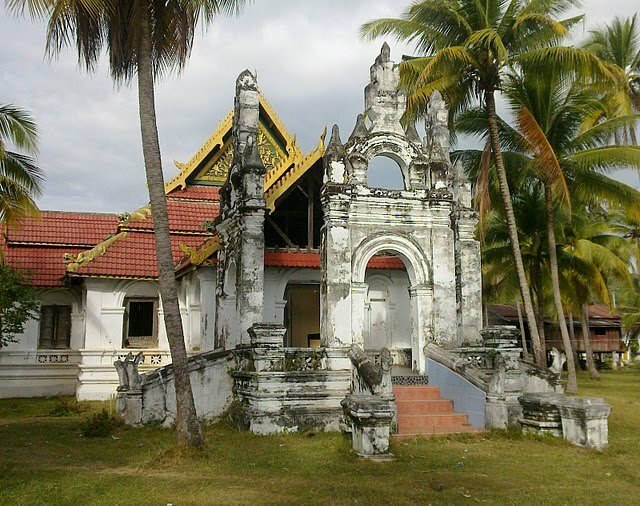 The best time to visit Si Phan Don is between November and January when the weather is cool and dry. 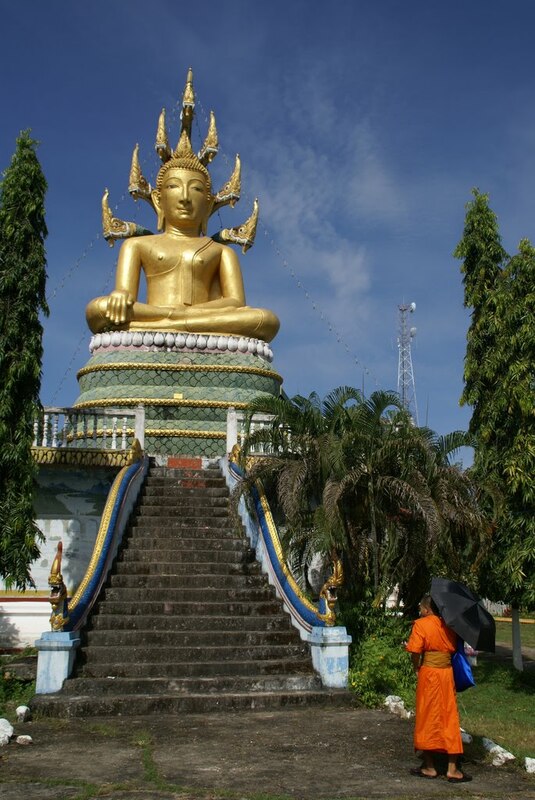 Pakse-Don Khong: From Southern Bus Terminal in Pakse buses or Songthaews leave several times between 10 am and 3 pm. 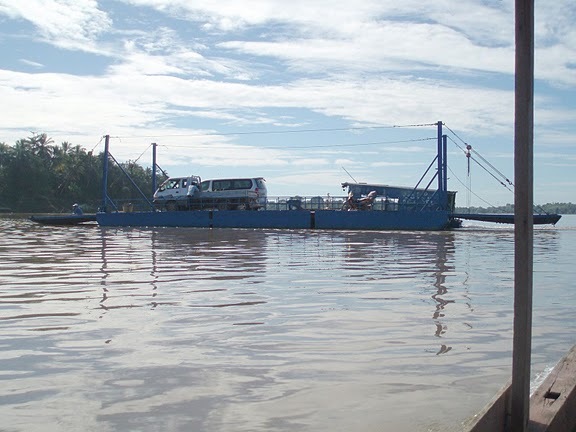 After 120 km (three hours) you arrive by ferry in Muang Khong. 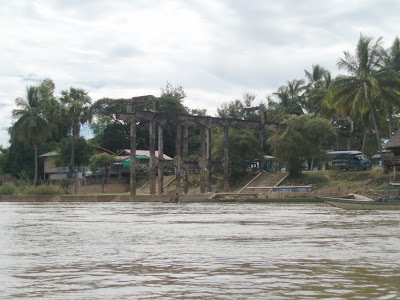 Pakse-Don Khon/Don Det: From Southern Bus Terminal in Pakse buses or Songthaews for Ban Nakasang leave several times between 7.30 am and 3 pm (three to four hours), then you take the longtailboat to Don Khon or Don Det. 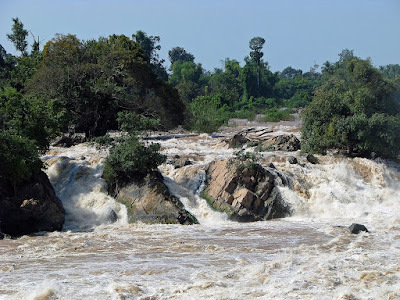 Ubon Ratchathani-Pakse-Khon Phapeng Waterfalls: Air-conditioned buses operate on Friday, Saturday, Sunday and public holidays. 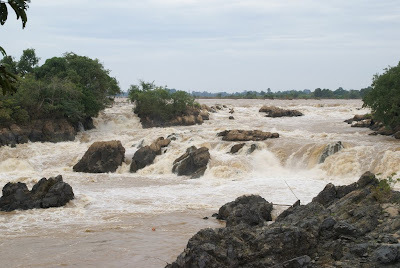 The bus leaves Ubon Ratchathani at 0730 and arrives at the waterfall in southern Laos around noon. From Khon Phapeng it departs at 1400 and arrives in Ubon Ratchathani around 1830. The bus stops in Pakse for people who want to overnight there. For more information call Ubon Ratchathani’s bus station (045 314 299) or the Transport Company at 1490. By car: There is a car ferry from Ban Hat to Ban Na on Don Khong island. 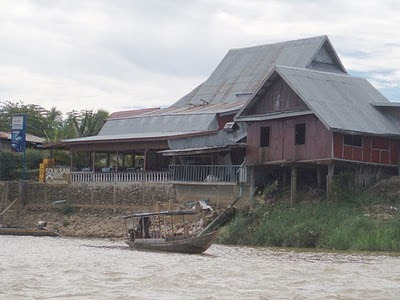 Don Khong is the main island, the big one, as lokal people say, when they want to prevent you from mistaking it with Don Khon, which lies near the Mekong waterfalls. 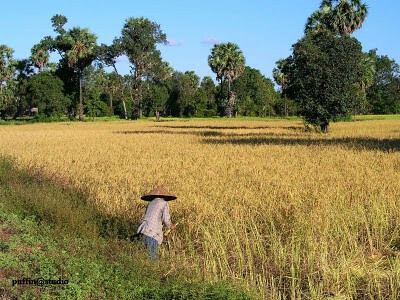 Don Khong is 18 km long and 8 km wide. 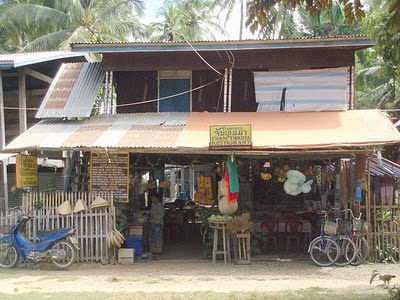 The island can easily discovered by bicycles, which can be rented from a woman on the street near the pier of Muang Khong or also in the guesthouses. On the bike you will discover a quiet rural life. But don't forget a hat, to protect your head from the strong sun. Read, what Stevie_Wes saw on a bike tour. 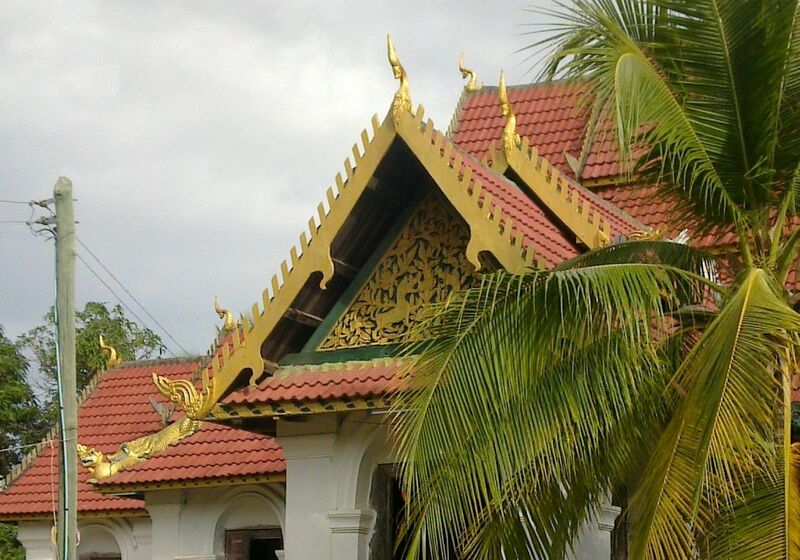 The naga heads on the roof of the main sim spill water from their mouths during raintime. Coconut and betel palms and Mango trees give the temple grounds some shade. 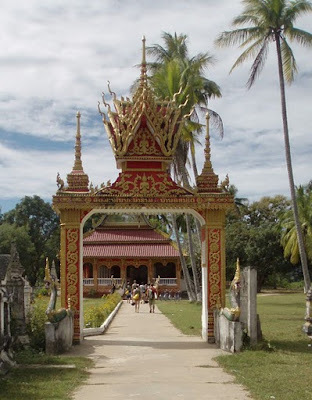 Muang Saen is a little village with view to the Cambodian boarder across the Mekong. 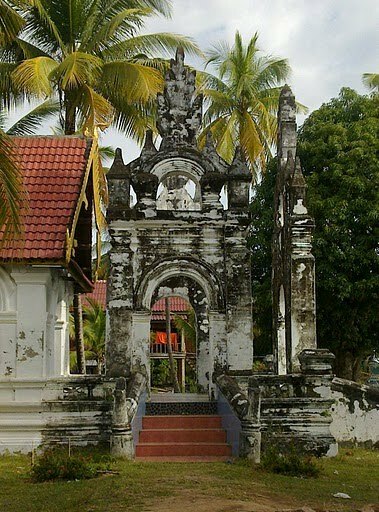 An entrance leads to the underground location of the nagas (Muang Nak). The legend says, the nagas will come to the surface to protect the Lao poeple when the country is in danger. 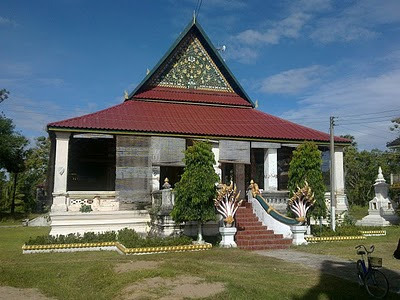 Ban Hua Khong at the north-western end of Don Khong was in 1924 the birthplace 0r Khamtay Siphandone, who became a postman and later the president of Laos. 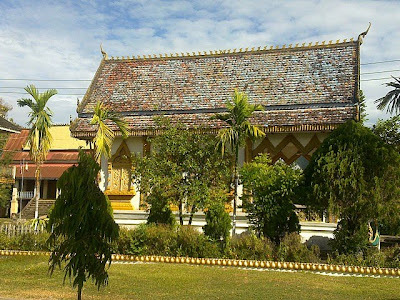 He has renovated Wat Hua Khong Pha Nyai with a cement seated Buddha image in the main sim. At the southern tip of the island you discover two small villages: Ball Huay and Ban Hang Khong. 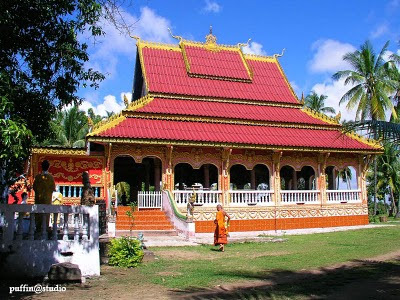 Here Wat Thepsulin Phudin Hang Khong, also known as Wat Hang Khong, has spacious grounds and a small sim. Nearby is a carved and painted wooden Buddha sanctuary and the dharma sermon hall. Then there is Wat Sllimangkhalaham in Ban Huay. Auberge Sala Done Khong: Closed in December 2010 - for renovation? No information on their website. From 26 USD. 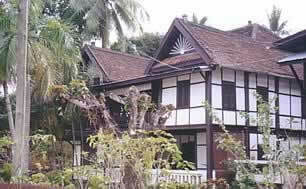 Air-con rooms with hot shower in wooden french colonial houses. Veranda areas to relax. "Popular with tour groups", notes travelfish.org. Very good reviews on tripadvisor.com. See picture by June. 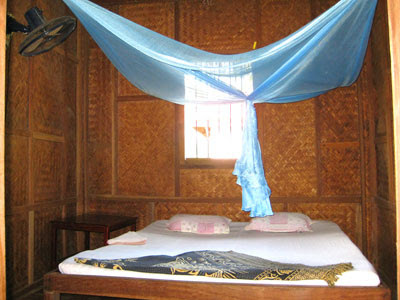 Bounma Guesthouse: Basic rooms in an old wooden house. 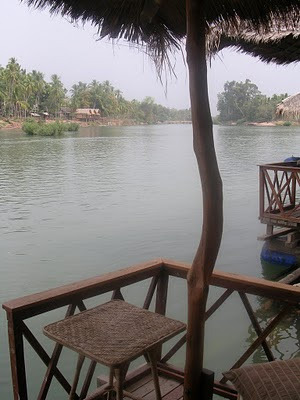 Mali Guesthouse: 30 USD. 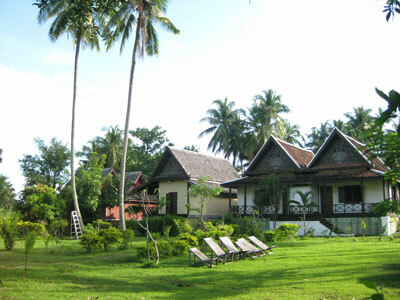 Ban Kangkhong. 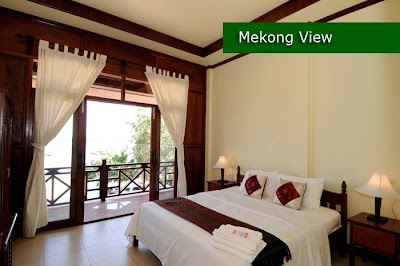 Mekong Inn: Ban Kangkong. 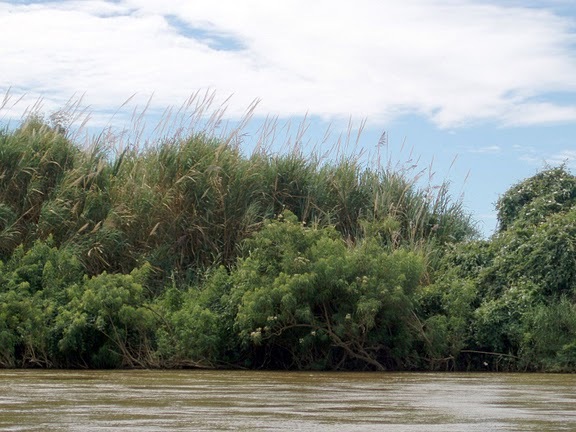 250m south of the boat landing. Fan rooms with shared bath are on the wooden second floor, air-con rooms with attached bath on the concrete first floor. 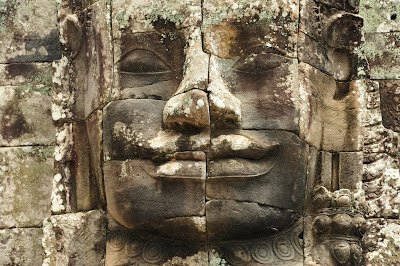 Good review on travelfish.org. Read also the review by Free Pants. 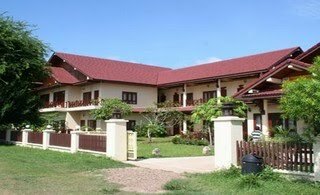 Pon Arena Hotel and Pon's River Guest House: From 20 USD. 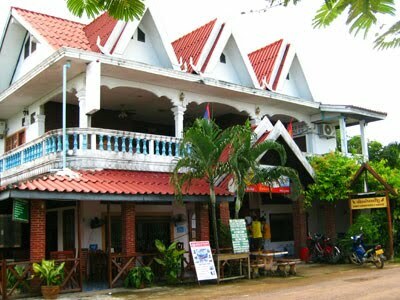 "It feels more like a small hotel than a guesthouse", comments travelfish.org. In fact a hotel has been added not far from the guesthouse. 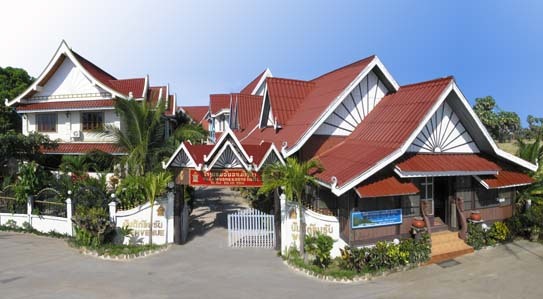 Villa Kang Khong: From 15 USD. Aircon from 15 USD. 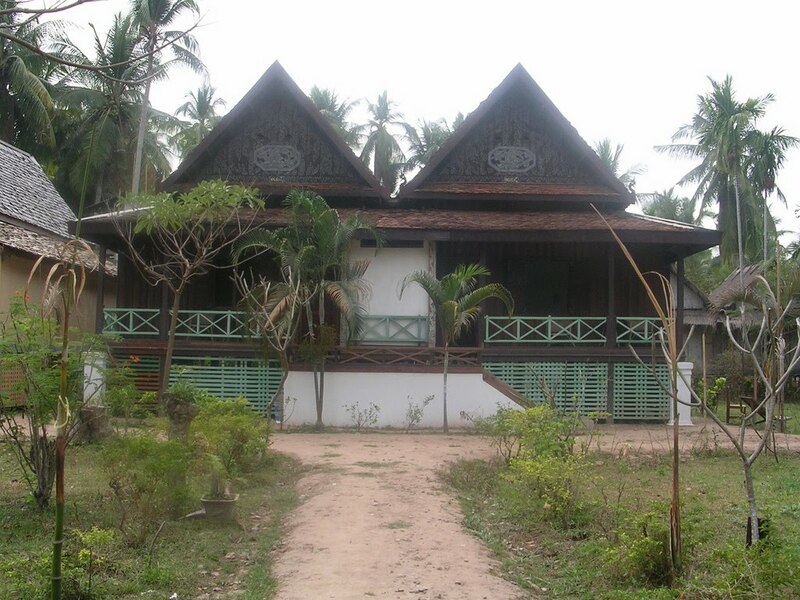 Resembles a traditional Lao wooden house, 12 rooms. They rent bikes. Good review on tripadvisor.com. "Try for an upstairs room though as the downstairs ones are a bit dark and cellar-like", is the advise of travelfish.org. Say Khong Guest House: Opposite the boat landing. Cold shower. Muong Sene Guest House: *Go there for the huge wooden rooms with charm and the relative tranquility (rooster around)", notes passplanet.com. The French Pier on Don Det - the end of a railway, that started on Don Khon, to move goods from the lower side of the Mekong Falls to the upper side, because ships could not get trough. Mr. Phao's Sunrise Bungalows: Read the review by Martin-Stefan in German. 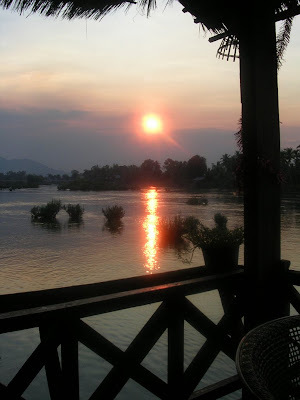 Mekong sunset, seen from Salaphae. 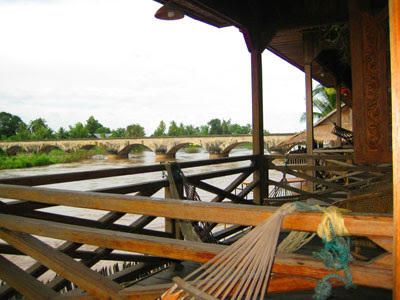 Seng Ahloune Guesthouse: Fro, 34 USD. Wooden bungalows are raised on stilts, set around the garden and on the river front. See also picture by Uwe. 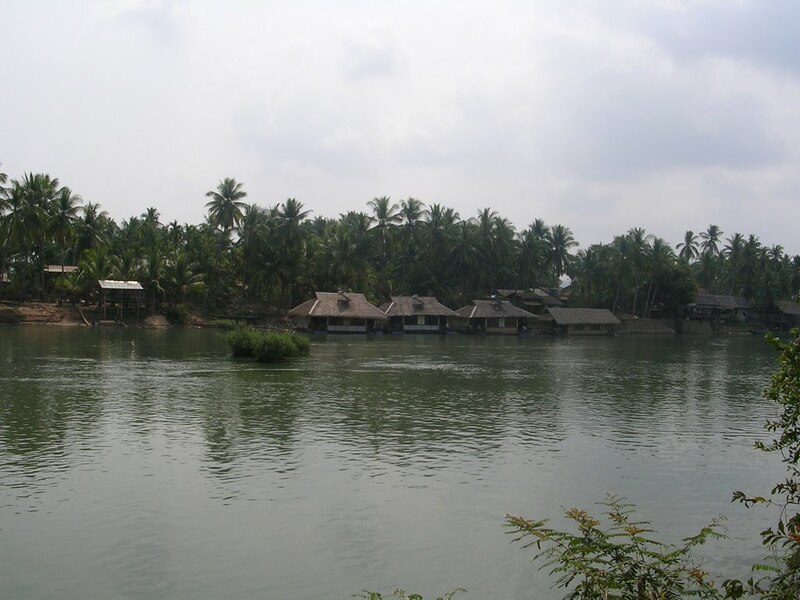 How to arrive here: Take a boat to Ban Nakasong. (20 minutes from Don Khon, 5 minutes from Don Det). Take a Tuktuk to the falls, ask for at least two hours staying at the falls. Is there a Future for the Mekong Dolphins? What a great overview of 4000 islands. I cant wait to go back.